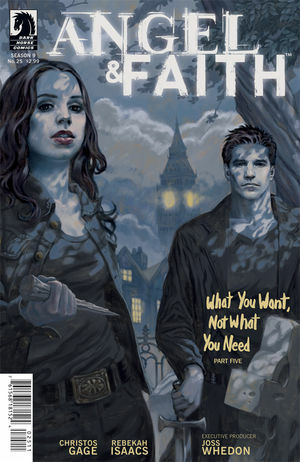 Angel & Faith #25 (Steve Morris cover) is the finale of the series, finally ending the fight that began in another series. While the ending makes sense and sets characters up for their next move, I admit to being a little disappointed in the cheesiness with which it is accomplished. The let-down is probably also due to how amazing issue #24 was. Millions of lives hang in the balance, and Angel and Faith just might be on the losing end of this battle. It’s times like these that call for drastic measures…how far will they go to save the world? Lives are lost, heroes are born, and as one chapter ends, another begins.